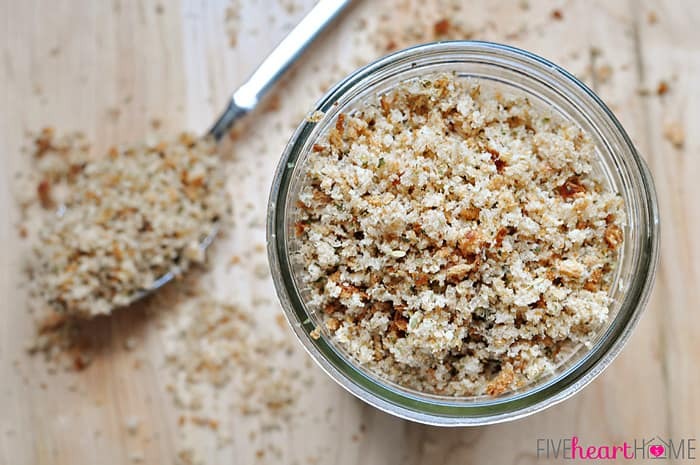 It’s so easy to make your own homemade breadcrumbs…in just a few minutes, for a fraction of the price, and without all of the preservatives of store-bought brands! 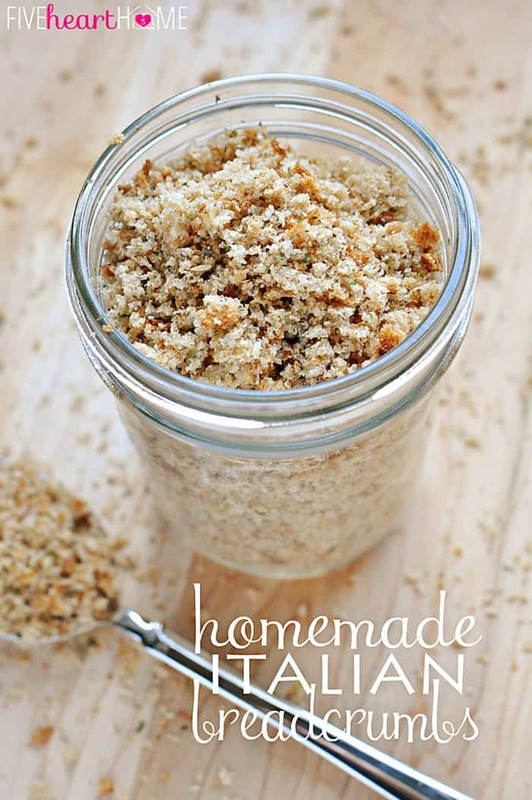 Even better, dried-out bread plus herbs and seasonings are magically transformed into flavorful Homemade Italian Breadcrumbs! And if you decide to make some Homemade Italian Breadcrumbs, you’ll definitely want to try this quick and easy Italian Baked Chicken! Y’all know I’m a sucker for make-your-own pantry staples. And today’s homage to that theme can be used in countless recipes year-round…simple, effortless breadcrumbs! To be perfectly honest, y’all, this one is kind of silly. I mean, breadcrumbs? 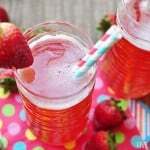 Who can’t figure out how to make those? Yet plenty (most?) of us purchase them from the grocery store in a little canister, full of preservatives and artificial ingredients and far more expensive than the pennies that a few slices of bread would cost. 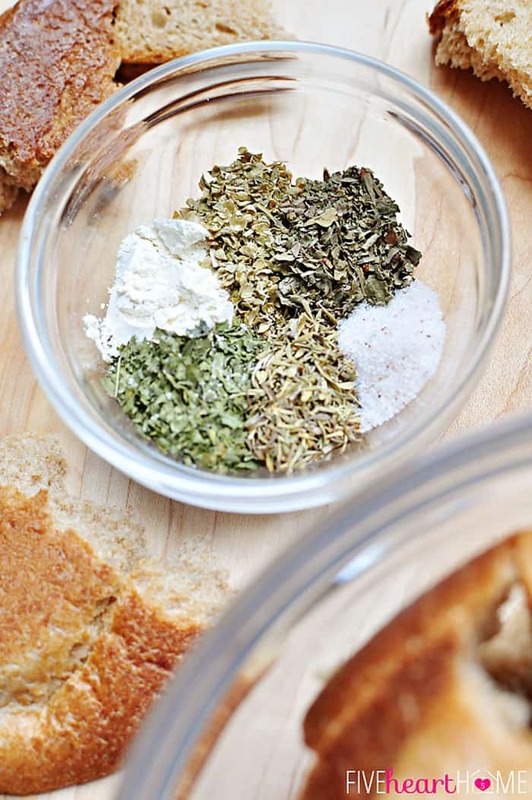 Furthermore, even if you already grind up your own bread into plain breadcrumbs, you might wonder what proportion of herbs to use for Italian Breadcrumbs, since plenty of recipes call for those. 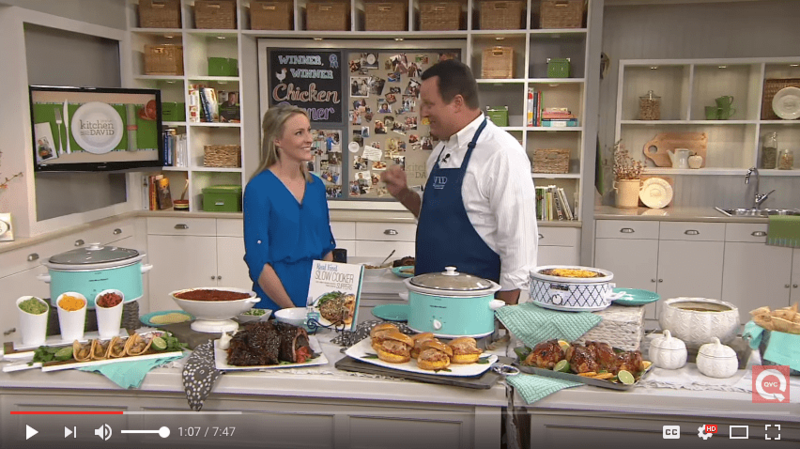 Well, no need to Google a recipe the next time you’re wondering…I’m going to take care of you right here today! 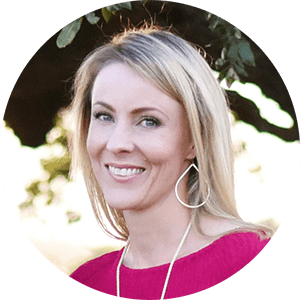 When you get to the end of a loaf of bread, whether it’s The Very Best Homemade Whole Wheat Bread or your favorite store-bought variety, that last heel can be kind of dried out. So I typically toss it in a baggie in the refrigerator, where it hangs out until it’s been joined by a few more rejected bread buddies. There may end up being a lone hamburger bun in there, an old dinner roll, a bit of leftover French bread, some of it 100% whole wheat, some made with white flour…whatever has seen better days (but isn’t stale or molded, of course), I save in my trusty little baggie. Then, when I have enough bread to make the dirtying of my food processor worth my while, I tear those old bread rejects into large chunks, add my dried herbs and seasonings (if making Italian Breadcrumbs), and whiz everything up into fine breadcrumbs. Embarrassingly easy, right? 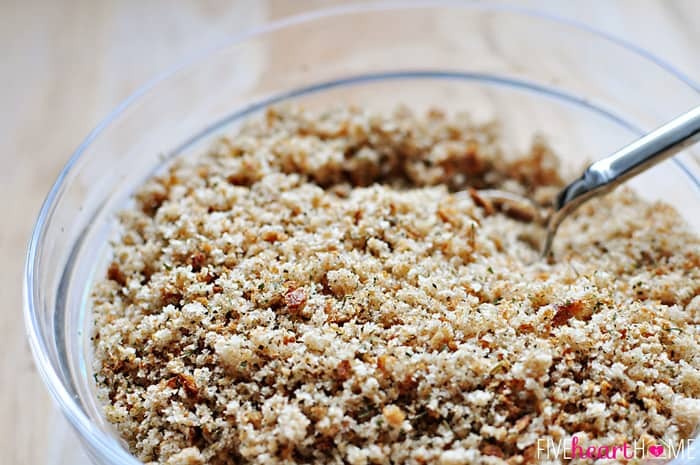 And not only are these homemade breadcrumbs less expensive and healthier, but you can also control the sodium and/or tweak the herbs, if desired. For example, for Homemade Italian Breadcrumbs…if you’re watching your salt intake, feel free to cut back on it. If you just loooove basil, go ahead and sprinkle in some extra. 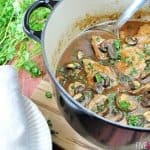 Oh, and if you happen to be a lucky duck with fresh herbs at your disposal, you may definitely incorporate those…just increase the amounts since dried herbs are more concentrated than fresh. After your bread has been processed, simply transfer the breadcrumbs to an airtight container and freeze for future recipe-making convenience! I typically dump mine in a gallon-sized, freezer-thickness baggie, squeeze out the air, zip ‘er up, and pop in the freezer. Easy as pie — er, breadcrumbs. I always grind my dried bread in a food processor, but a blender should work as well. If you want to make breadcrumbs but your bread is too fresh, preheat the oven to 250°F and place the slices of bread directly on the oven rack. Bake for 20 to 30 minutes or until the bread is dried out and toasty. Remove the slices from the oven, allow to cool, and then proceed with the recipe. In just a few minutes, stale bread plus herbs and seasonings are transformed into flavorful Homemade Italian Breadcrumbs, for a fraction of the price and without all of the preservatives of store-bought brands! Tear stale bread into large pieces. Place in a large food processor or blender. Add dried herbs, garlic powder, salt, and pepper. Process/blend/pulse until fine crumbs form. 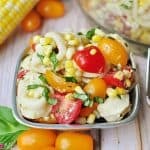 Use immediately or store in an airtight container in the refrigerator or freezer (depending on how long before you use them). If you are watching your sodium intake, feel free to decrease amount of salt. You can also make your breadcrumbs with 1/4 teaspoon of salt to begin with, taste, and then add the remaining 1/4 teaspoon if you feel it's necessary. Tweak the herbs to your liking, or if you prefer to use fresh, be sure to increase the amount used since the flavor of dried herbs is more concentrated. 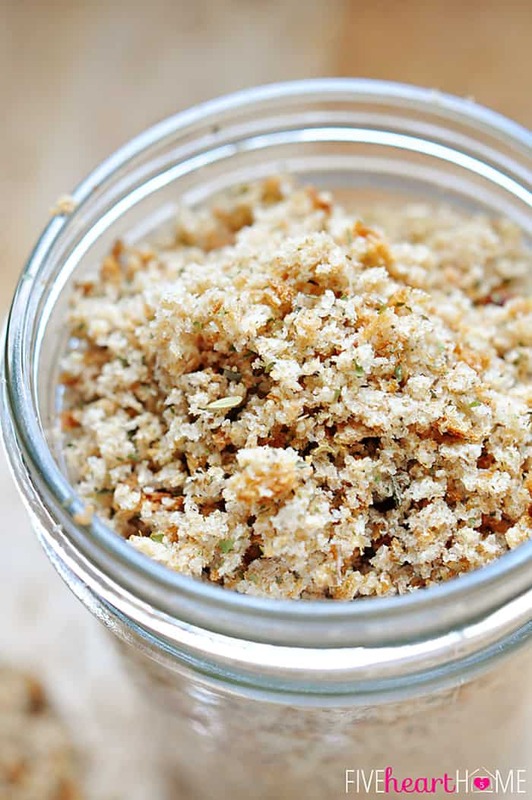 If you plan on using your breadcrumbs soon, they will keep in the refrigerator just fine. If storing breadcrumbs in the freezer, place inside two freezer baggies and squeeze out any air. They will stay fresh for several months this way. Whenever you need breadcrumbs for a recipe, you can thaw for a few minutes at room temperature and then measure out. 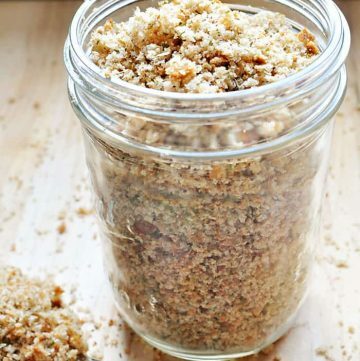 Or you can portion breadcrumbs by the cup or half-cup into small baggies before freezing. Thank you. 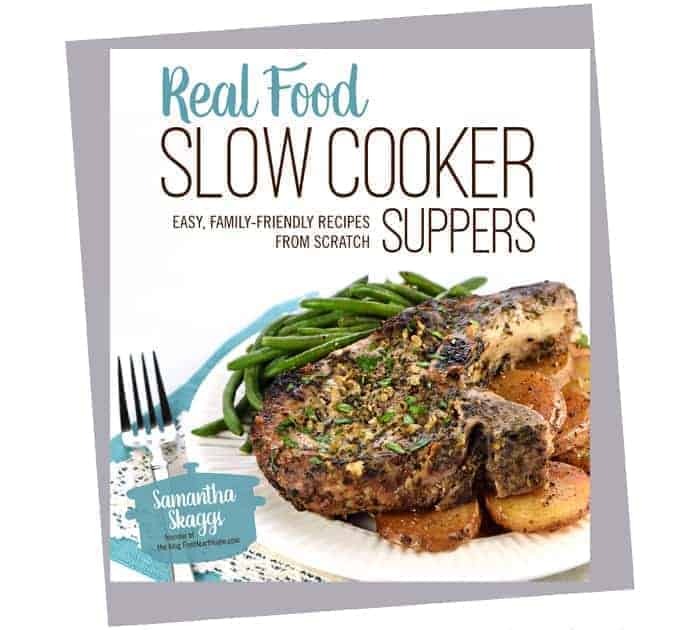 A nice recipe to have on hand. Oh wow, this is fantastic and you’re right, so easy. I love to use Italian Bread Crumbs in so many things. I will love this even more. YAY!! Thank you. Stopped by from The Weekend Retreat. This is great! and no preservatives. I’m definitely going to try this. Thanks! Wonderful, Adriana! I hope you enjoy using these in lieu of the storebought canisters of breadcrumbs. These taste better and you control exactly what’s in them! 🙂 Thanks for taking the time to comment…hope you’re having a great week! Thanks for this recipe! I was wondering – I already have some homemade plain dry bread crumbs; would I just start with your measurements of the dried spices and adjust to taste? Thanks! I think that would work just fine, Janet! 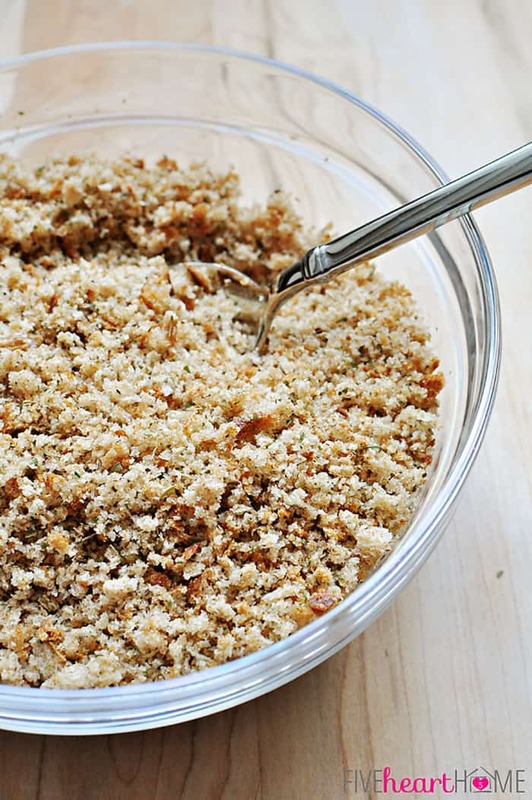 Sometimes I have homemade plain breadcrumbs in the freezer and I just add Italian seasonings right before using them in a recipe that calls for Italian breadcrumbs. 🙂 Enjoy! Thanks for the recipe! I’ve been wanting to try making my own breadcrumbs but never got around to searching for a recipe. Then I stumbled upon your site via your recipe for your Italian Baked Chicken. Another thought for stale bread…my kids (like many, I assume), refuse to eat the crusts of their sandwiches. I hate throwing them away! Instead, cut them off before making the sandwich, and throw them in the baggie in the fridge, too! I already make my own breadcrumbs so I just wanted a list of seasonings for my own Italian ones. 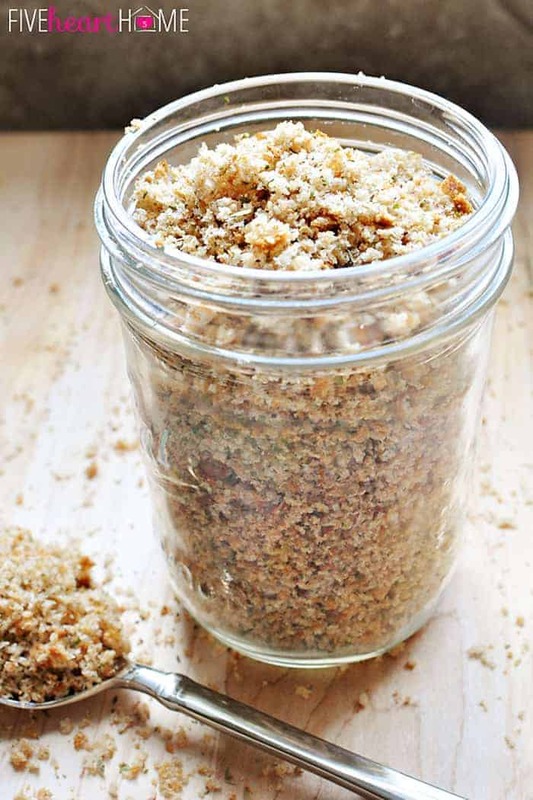 If you toast the breadcrumbs they can be kept in a canister in your cabinet and the seasonings bloom as well. I already have plain panko bread crumbs .. how many cups of the panko would I need for the amount of spices you have on here? Hi Marni! I haven’t tried this recipe using panko breadcrumbs, so I’m not sure how well the herbs and spices would stay distributed. But if you’d like to try, the yield of this recipe is approximately 3 cups of breadcrumbs, so that’s probably the amount of panko I’d start with. Good luck! Thank you! I was surprised to find high fructose corn syrup in bread crumbs. Just wanted to say thanks for the recipe and let you know the word Homemade is misspelled on your recipe. Really like this mixture, it makes chicken/pork etc much more interesting and flavoursome. I tend to dry the bread first, is that correct? Hi Trevor! I do use old, already-dry bread, but I don’t make a point to dry it first. But you certainly can if you wish to! 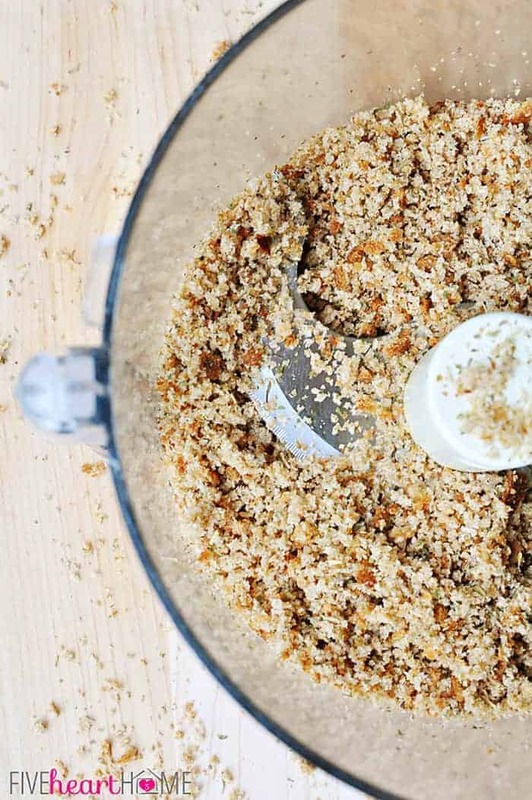 I never buy breadcrumbs at the store any more thanks to this recipe! I am a fan of keeping the bread crumbs in the freezer! It frees up refrigerator and cabinet space.